I'm making headway on the story to feature in Killjoy #3, 'Valentine'. 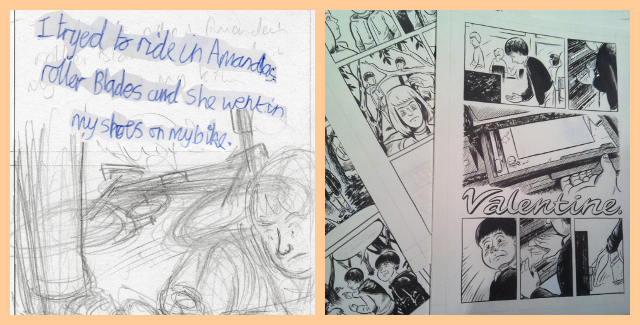 I'm particularly enjoying incorporating text from my personal diary of 1996: I'm scanning the original leaves and rearranging the text to combine with preliminary sketches to merge into 'digital pencils' for the final pages (the left image below shows the text as pasted, before alignment - spelling mistakes to be left unaltered). There will be four such pages in the final quarter of the story. I'm making a concerted effort to finish inking this issue with time left to produce a tone layer which should bring a little more depth to the images. Also, a new review of Killjoy #1 was recently published on the Small Press Comics Review website.